What cover does ESNZ have? Cover against your Legal liability against claims for compensation in respect of unexpected and unintended personal injury or property damage arising out of their business activities within New Zealand only. Statutory Liability Insurance is designed to provide cover to the society and its trustees, officers and employees for defence costs and fines/penalties* in respect of unintentional breaches of almost all Acts of New Zealand Parliament, with the exception of the Health & Safety at Work Act where the policy covers defence costs and reparation orders (this Act expressly prohibits insurance for fines and penalties). 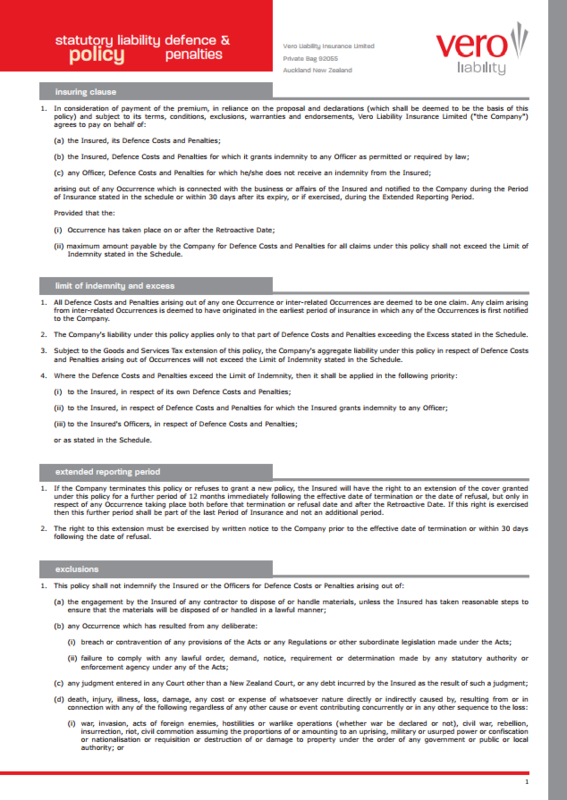 * No cover is provided in respect of civil proceedings (defence costs or civil penalties (pecuniary penalties)). Note, depending on the circumstances and subject to policy terms and conditions cover may apply to official investigations. Simply complete the Vero Liability proposal and e-mail it to [email protected] and we will organise details including certificates to be e-mailed back. You cannot insure against fines if you get prosecuted. So, for example if ESNZ was prosecuted for a breach of the health and safety laws, the organisation cannot claim insurance for the amount of the fine. It can claim for the legal fees and settlements but not the fines. 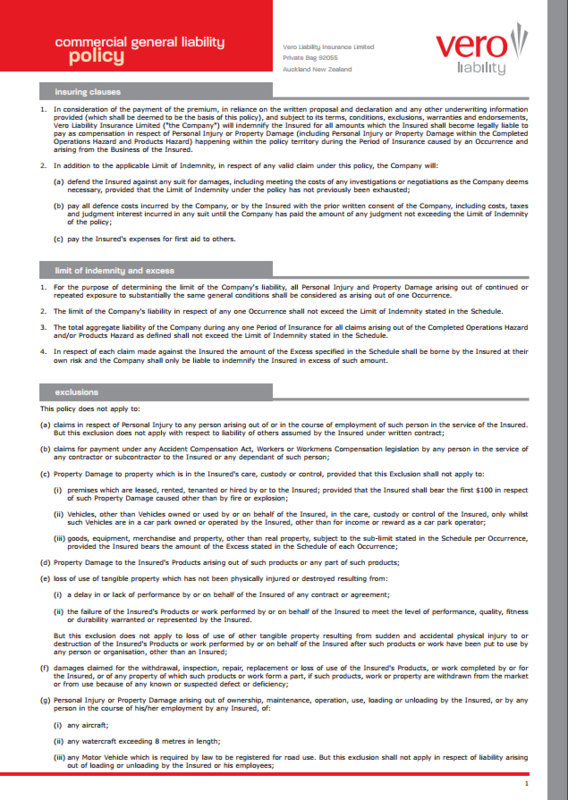 Area groups that are incorporated societies are also not covered – more on this later in the FAQ. What do we need to do to ensure we are meeting our insurance obligations? You need to ensure you are complying with the ESNZ general regulations and your own discipline rules. You need to ensure you have a clear health and safety plan and that you have used the checklists on the ESNZ website to ensure you have covered all the areas we would expect to be covered. You need to appoint a Health and Safety officer for your event. You need to take all precautions to ensure everyone goes home safely. Do we need to advise ESNZ about our events? Not specifically, most disciplines have an annual calendar of events which sets out the “official” events for the season. What happens if the property owner where we hold our event wants a higher amount of cover than what the insurance policy covers? On the odd occasion, property owners who own the land where you are about to hold your event, require a higher level of cover. This is usually due to their own policies and procedures. We have had scenarios where a corporate farm needed $10 million liability cover for an eventing competition and a forest owner needed $2 million firefighting cover for an endurance ride. Our policy does not comply with these levels. However these issues can be dealt with easily by giving us a call and we will get in touch with the insurer and let them know what you require. The additional cost of these extra cover premiums need to be borne by your organising committee so make sure you find out well in advance what you need so it can be built into your event budget. Who is covered by the ESNZ policy? All members are covered by the ESNZ policy for actions at an ESNZ event or within ESNZ equestrian activities such as competing at shows and organising/undertaking equestrian events. All ESNZ registered officials who are current full financial members are covered by this policy at all times when they are officiating. If you are an ESNZ area group or affiliated club in the case of Endurance, then you are automatically covered by this policy for equestrian events. ESNZ Registered Coaches (with current ESNZ and Coach Registration), with current first aid certificate, coaching in NZ with a current Health & Safety Plan in place. you are not an area group or affiliated club, you might be a sports club or a group of people keen to hold some events). You are not covered if you are an area group or affiliated club that has current status as an incorporated society. This is because as part of your incorporation you have created your own independent legal identity and we must register that separately for insurance cover. How come area groups and affiliated clubs that are incorporated are not covered? Over the past few years, New Zealand’s legislation has undergone numerous changes particularly relating to the operations of societies (for example – Trustees Act, Health & Safety in Employment Act). Insurance companies are not prepared to offer any level of cover to a separate legal entity they are unaware of and which hasn’t disclosed what activities they are actually undertaking. This will only lead to frustration and disappointment in the event of an issue occurring for both the individual society and ESNZ. So what do we do if we are an incorporated society? If your group is an incorporated society you can take advantage of the “Group Policy” cover provided by AON and ESNZ for equestrian groups holding equestrian related events. This initiative has been put in place to provide cover for separate legal groups that want to run equestrian events. It costs $270 plus GST for the 2016-17 year and provides exactly the same cover as you would get under the main ESNZ scheme (see question one). This represents a significant saving for groups which has been achieved through the longstanding relationship with AON and the buying power of the national organisation. The same cover on the open market could cost anywhere between $800 to $1,000 for a year. Can any other equestrian related groups sign up to this policy? ESNZ will then invoice you for the premium which is in the order of $270. 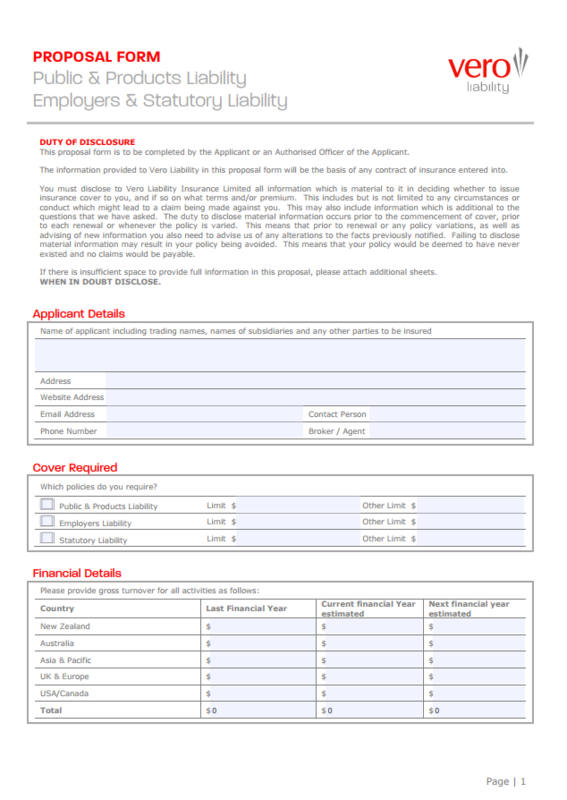 The forms look daunting but you don’t need to worry, just fill in as much as you can and get in touch with the friendly staff at AON and they will assist with the rest and send the details to us for invoicing. What does it mean if we sign up to the group policy? It would be reasonable to accept that by taking advantage of this initiative your group or entity agrees to abide by ESNZ rules and general regulations as well as any discipline rules and expectations. This might include collection and payment of ESNZ and discipline levies where applicable. If you have any questions about the rules they can all be found on the ESNZ website. But you can check with ESNZ staff at any time for clarification. Is there a problem if my incorporated society chooses not to buy insurance cover for its event? ESNZ is of the view that all events should have public and statutory liability cover as if something happens at one of your events ESNZ may also be implicated as we provide the officials, the rules and the general operating environment. If you choose not to have insurance it will be for ESNZ and your discipline board to determine if your competition will be “unsanctioned” under Article 105 of the ESNZ General Regulations. This is not something we would do lightly but ESNZ has an obligation to its members to protect them from financial and reputational risk. If your event was unsanctioned ESNZ officials and rules would not be able to be used, riders’ results would not be recorded and no FEI qualifications could be awarded. Any ESNZ or FEI Official officiating at an unsanctioned event may be liable for penalty as has recently happened in Europe with Jumping Officials. We do not want to go down this path. You would also need to advise your competitors, volunteers and officials that your event has no insurance cover. My question hasn't been answered here, what now? If you have a question that is not answered here please send it to [email protected] and she will answer it for you and then add it to this fact sheet for future reference. Equestrian Groups / OCs that are incorporated societies and wish to sign up to the Group Insurance Policy can do so by completing the proposal form above.